eSupply Depot offers the complete line of Little Giant magnetic drive pumps that are designed for circulation of acids, alkalis, solvents, brine plating solutions and other special fluids for use in environments such as hospitals, chemical companies, photo labs, dry cleaning plants, car washes, machine shops, laboratories, manufacturing plants, chip manufacturing, print shops and wineries to name a few. The MD Series designed to handle mildly corrosive solutions and chemicals features leak proof seal-less magnetic drives and is designed for in-line, non submersed use. The SC Series is the same as the MD series only designed to handle Semi-Corrosive solutions and chemicals. The HC Series also is the same as the MD and SC Series except designed to handle Highly Corrosive chemicals and solutions. 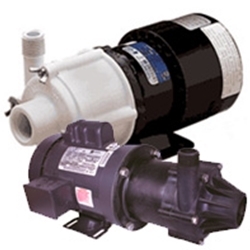 The larger MD Pumps are which utilize Carbon filled Kynar material for highly specialized application. For those chemicals that attack pump parts eSupply Depot offers the Little Giant Tube Pumps, Peristaltic, Pumps that are designed to handle fluids that should not be exposed to pump parts. Fluid movement is achieved by revolving roller arms that squeeze fluid through a tube. The fluid being pumped comes in contact only with the tube. This pump is ideal for moving solutions such as slurries, harsh chemicals, detergents, sludge, sterile fluids, syrups and metered solutions. Our most frequent users have been in Battery Manufacturing applications.